In the life around us, everything is connected in some unexpected ways. This fact was very well illustrated by Charles Darwin, the famous scientist, in his book “The origin of species”. He has managed to prove in his short example that the number of old maids and their domestic cats in the area can influence the amount of clover in the nearby meadows. How can cats influence the clover?! They do not eat it, right? But still, there is indeed a relationship. 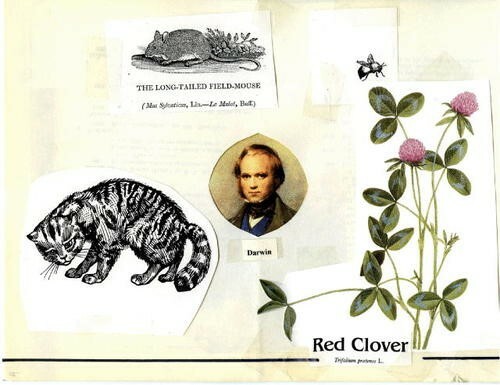 Darwin began from the most well – known fact: clover is pollinated by bumble bees. Without pollination, clover cannot produce seeds – and next year, no new clover plants can grow. But the nests of bees can be destroyed by field mice. Mice can also eat the bees themselves. And the number of field mice is controlled by cats that go out from the houses and catch them. More people with cats means less mice and more clover as a result. This example is too simplistic, of course. But this is a very striking example of a more complex issue – how food chains work in the wild. Scientists from early on have tried to understand the relationships between various organisms in nature. The most obvious relationship is feeding. Feeding can also be describes as movement of energy and nutrients around the ecosystem. 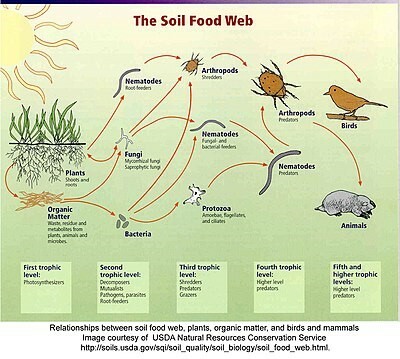 At the beginning of every food chain are those who produce nutrients. And on our planet, the only producers are photosynthetic organisms: photosynthetic bacteria, algae and plants. Because they are able to perform photosynthesis, they can use water, the energy of the light and carbon dioxide to make their own sugars and proteins. The group that is standing next in the line is formed by the animals that feed on the plants. They are called primary consumers. Those are the aquatic animals that feed on algae, as well as various herbivores that feed on the land plants. Typical examples are cows, rabbits, snails, etc. All these animals can become food, too. Most of them have predators – reptiles, birds and animals that feed on them. They can also be called secondary consumers. Frogs, kingfishers, foxes are typical examples of those. In any ecosystem, there is always a predator that is stronger than anyone else. Killer whales or sharks reign the seas; eagles, wolves and lions dominate the land. Those animals do not have any natural predators of their own. 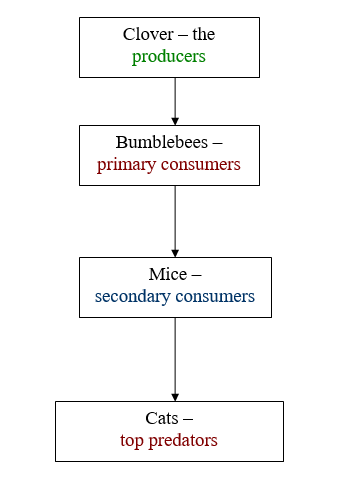 They are the tertiary consumers or top predators. One animal can eat different kinds of organisms, and a plant can have several pollinators. For example, field mice can eat seeds, insects, and snails. Not only bumblebees, but domestic bees and butterflies can be pollinators of clover and other plants in the meadow. Each organism goes through several stages in course of its development. And at each stage it can be attacked. For example, clovers grow from seeds, and the flower develops only in the end stages. And at each stage there would be a potential predator: birds and mice that eat seeds, caterpillars that eat leaves, soil insects that destroy plant roots and bugs that attack flowers. Besides direct predators, there are also parasites – organisms that choose another organism as a victim, live on it or inside it and use the nutrients of their host to survive. Parasites can either kill their hosts or make them weaker and not able to reproduce. In this way, they also influence the quantity of certain species. All animals and plants die. And as they die, they become food for fungi, bacteria and other organisms that feed on dead matter. They are called decomposers. In this way, the dead bodies are transformed to free nutrients that can be used again. Without organisms that can decompose the dying matter, nothing new can grow. Besides relationships between predators and prey, hosts and parasites, there are also symbiotic relationships. Typical examples of symbionts are nitrogen – fixing bacteria living in the roots of legumes that exchange nitrogen for sugars with plants. Pollinators, like bumblebees, are symbionts, Such organisms also contribute to the overall well-being to everyone living in this particular ecosystem. Energy is produced, transformed and moved in a cycle everywhere. And when we interfere in these complex relationships, we may destroy the whole ecosystem as a result. One of the important jobs that ecologists do is to investigate those complex food webs and monitor them, protecting the ecosystems from destruction. [1.] Frank N. Egerton (901 January, 2007). Understanding Food Chains and Food Webs. Bulletin of ecological society of America. Volume 88, Issue 1, Pp. 50-69.